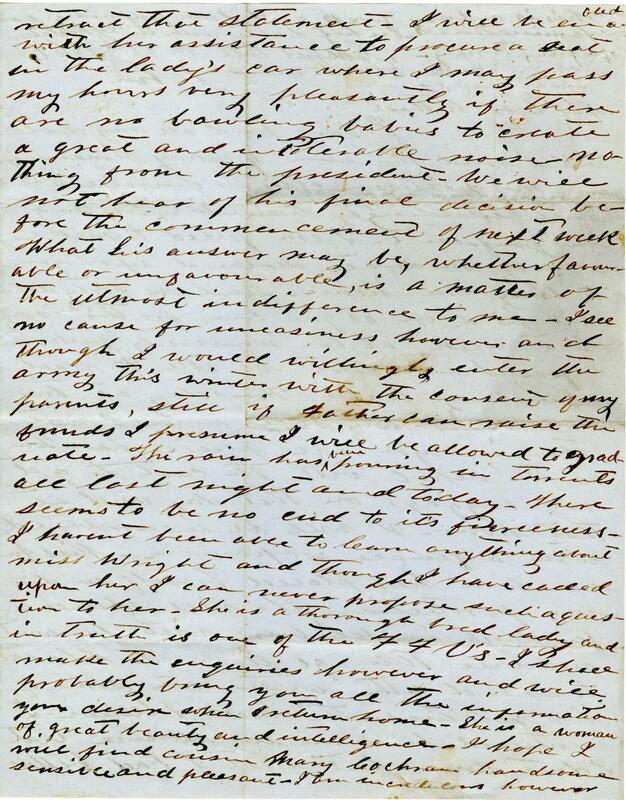 Item Description: Letter from John Steele Henderson to his mother, Mary Ferrand Henderson. He writes that he needs more money for his tuition or he will be forced to leave the University of North Carolina. He is due to come home after examinations and plans to travel with a female companion, Miss Anna Ashe. He is still waiting on word from the President, likely about joining the Confederate Army. He claims that he wishes to join the army but also wants to receive his degree. John also writes about his feelings towards certain women. 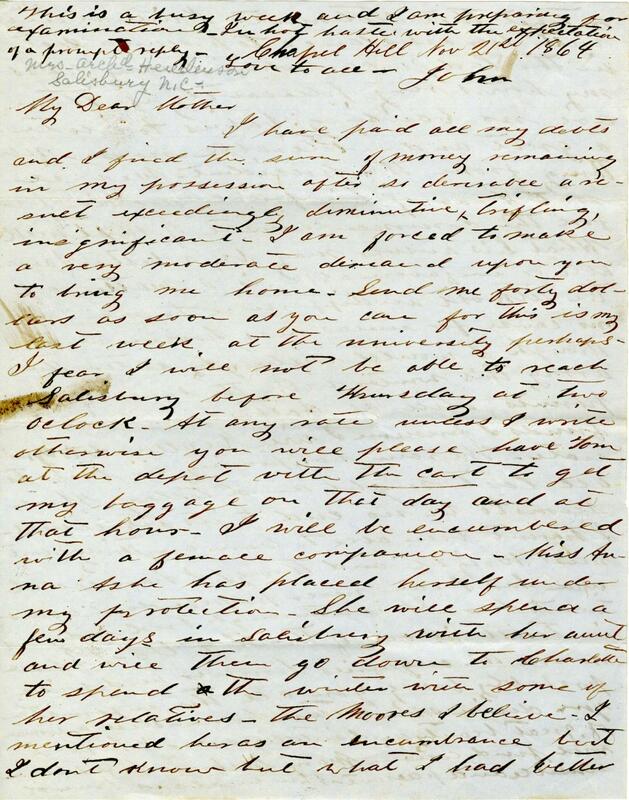 Shortly after this letter was written, John Henderson Steele enlisted as a private in Company B, 10th North Carolina Regiment. I have paid all my debts and I find the sum of money remaining in my possession after so deniable are such exceedingly diminutive, trifling, insignificant. I am forced to make a very moderate demand upon you to bring me home. Send me forty dollars as soon as you can for this is my last week at the university perhaps I fear. I will not be able to reach Salisbury before Thursday at two o’clock. At any rate unless I write otherwise you will please have Tom at the depot with the cart to get my baggage on that day and at that hour. I will be encumbered with a female companion, Miss Anna Ashe has placed herself under my protection. She will spend a few days in Salisbury with her aunt and ill then go down to Charlotte to spend the winter with some of her relatives, the Moores I believe. I mentioned her as an encumbrance but I don’t know but what I had better retract that statement. I will be ever glad with her assistance to procure a seat in the lady’s car where I may pass my hours very pleasantly if there are no bawling babies to create a great and intolerable noise. Nothing from the president. We will not hear of his final decision before the commencement of next week what his answer may be, whether favorable or unfavorable, is a matter of the utmost indifference to me. I see no cause for uneasiness however am I though I would willingly enter the army this winter with the consent of my parents, still if Father can raise the funds I presume I will be allowed to graduate. The rain has been pouring in torrents all last night and today. There seems to be no end to its fierceness. I haven’t been able to learn anything about Miss Wright and though I have called upon her I can never propose such a question to her. She is a thoroughbred lady and in truth is one of the 77 U’s. I shall make the inquiries however and will probably bring you all the information you desire when I return home. She is a woman of great beauty and intelligence. I hope I will find cousin Mary Cochran handsome sensible and pleasant. I am incredulous however this is a busy week and I am preparing for examinations. In hot haste with the expectation of a prompt reply. This entry was posted in Southern Historical Collection and tagged Chapel Hill (NC), John Steele Henderson, University of North Carolina. Bookmark the permalink.